If you haven’t heard by now, offices are out. Working remotely is in. Why work in a cramped cubicle and have to deal with office politics when you don’t have to? The opportunity to work via flexible, remote, virtual teams has arrived. And the benefits don’t just extend to employees –but employers as well. Companies are finding it much more cost effective to operate virtually. They are able to reduce their overhead and cut costs, while employees enjoy the option of choosing when and where to work. As more organizations shift towards a remote workforce, leaders must become adept at delegating. 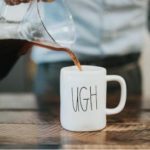 However, delegating isn’t as easy as it sounds –as entrepreneurs, outsourcing is something that we struggle with, and it takes time and effort to hone this essential skill. Mastering it, though, can be the difference between accelerated growth –and stagnating. Working with virtual teams can vastly change the power dynamic within an organization. As they say, with great power comes great responsibility. Therefore, along with empowering your team, you are going to have to up your game as a manager as well! With this in mind, we have put together a list of some of the top tips we could find for rocking at delegation with virtual teams. If you haven’t taken the time to create standard operating procedures (SOP) and training material to onboard new team members, now is the time. How will you be able to delegate something if you don’t know and understand the process yourself? Sorting out the minutia of your process, whether it is administrative, sales, or something else can seem daunting at first. Typically people will choose to take the Forest Gump approach when their way through something, working half on instinct and half on intuition –with no clear understanding, rather than admit that they have no idea of what is going on. You should also acknowledge that having a proper structure in place is not a be-all-end-all –you’ll want to ensure that your processes are clear, effective, and easy to follow. Make sure you take the time to fully onboard your new virtual hire, and be ready to help them if any questions arise. Finally, dedicate resources to put your process to paper. If you don’t have that capability internally, hire an organizational consultant to outline a system for your business. Or, if you’re a smaller company, consider enlisting the help of an experienced VA. The efficiency that you gain in the long run will make it well worth it! It will allow all parties involved to understand expectations and provide the necessary training to set everyone up for success. The success or failure of any given virtual team can often be summed up in one word: communication. 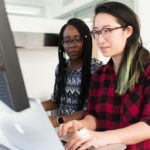 According to a recent survey by Software Advice, 38 percent of respondents identified communication as their key issue when working on a virtual team. This means you’ll want to work hard to ensure that you establish clear methods of communication, right from the start. How can you ensure that your team is always in-touch, responsive, and on-point? Going analog aka calls, text, and voicemails may cut it for casual conversations, however, to manage a virtual team you need to utilize tools like Basecamp and Slack are ideal. For more project management tools get your FREE download! Also, realize that certain groups of people communicate in very different ways. It’s important that you understand how team members of different ages, or in different countries prefer different communication channels. Take, for example, phone calls. Older demographics much prefer a call over an email, while younger workers are the exact opposite. 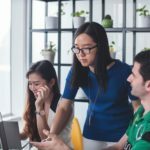 Avoid failed collaboration by helping team members discover the best channel for communication. Be flexible, offer different methods of communication with team members, and accommodate diverse communication preferences. Understand that context and details matter. You must document everything. A symptom of working in virtual teams is that boundaries are often blurred, particularly when it comes to responsibilities. People are only going to see what’s on their dashboard. You no longer have small talk in the office where many of the details are filled covered by happenstance. This is why documenting everything is so essential. A chain of communication is created that everyone can reference. By each team member documenting their efforts and challenges, discrepancies and misunderstandings will be spotted early on. Utilizing a collaborative project management platform like Asana, Trello, or Basecamp will develop a narrative for everyone to reference. It will create a repository where everyone can upload emails, documents, images, and other files. No matter which app you use, it’s essential to have the digital equivalent of an office whiteboard in front of all team members. It will go a long way at keeping the team on track. Your key role as leader of your virtual team will be that of project manager. In order for your team to function efficiently, you need to be discussing and assigning projects to your team members –both one-on-one and on a group basis. I recommend you perform monthly one-on-one calls to discuss delegated projects, questions, or concerns. Furthermore, you need to be holding bi-weekly or monthly calls with your entire team, in order to update each initiative’s status and keep everyone on the same page. Your calls should always interface with your project management tools. Make sure your tasks and responsibilities line up, and everyone understands their specific tasks. Getting on a call with large groups is very easy these days with apps such as FaceTime, Skype, RingCentral or Zoom. Just be sure you communicate the app requirements and send the logins beforehand. Or even better, by creating a repeating calendar event. 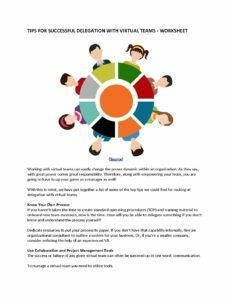 Get our Tips for Successful Delegation With Virtual Teams Worksheet delivered right to your inbox. Mission creep happens to the best of us in the business world. What seems like a small, easy task in the beginning balloons into a mammoth monstrosity that devours all resources. Don’t get discouraged, instead take a step back and break it down into smaller parts –and assign different aspects of the project to the right VA –or other professionals. Understand that you have a full team. Utilize them to their fullest extent by cross training. This will allow much more flexibility and will enable your business to pivot if something changes. If you haven’t used design sprints as a project manager yet, you should definitely look into it. The concept of a design sprint (in Google’s terms) is to identify a problem their customers are experiencing and then quickly developing a prototype that addresses the issue. In the project management world, you can use a sprint for virtually anything that can be finished in five days or less. Ideally, as the project manager, you would meet with your management team, and decide specific ‘sprints’ or tasks you can finish within the span of a week. From there you will hold your Monday meeting with all of your team, where you break apart and assign the tasks to your resources. At the end of the week, you assess your performance, and whether or not your team completed the tasks. This is an excellent way to optimize your resources and get the most performance out of your team. If you want to read more about design sprints, look here. There is even a fantastic book on the topic. As they say, there is no ‘I’ in team. As a leader, you need to ensure that all members on your team are taking ownership of their respective duties, and also feel included in all things. You should make expectations very clear both individually and as a group –particularly when it comes to workflows, assignments, timetables, and your ultimate goal. As we mentioned before, just because everyone is nodding their head in agreement as a group, don’t assume anything. The “I’ll figure it out” mentality is common. We’ve all done it before. A trick I recommend to gain additional assurances is to add this simple practice after your meetings. Before you wrap up, review each participant’s next tasks. Ask each individual what they are doing and how they perceive their expectations. Furthermore, set a deadline for all tasks and work assigned during the meeting. Set Deadlines: Be sure to set a timeline –and assign deadlines to projects. Manage your time and resources intelligently. For larger projects, break them up and assign due dates to each task. If you miss the opportunity to set deadlines, you will encounter missed opportunities, which can be costly. Be Specific: Be very specific when you delegate. Explain the task, and what the outcome should be for the task. Follow Up: Don’t forget to follow up. 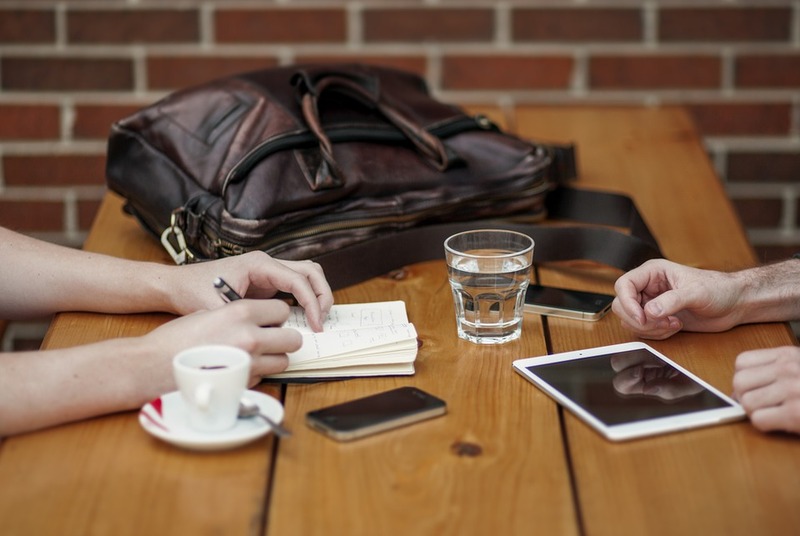 Relay the fact that team members will be expected to report back at the next meeting. Never miss the opportunity for a learning moment. Educate your team about what went wrong, what went right and how you can improve the next time around. Feedback (or lack thereof) can be a double-edged sword when working with virtual teams. It is extremely important for remote workers, yet it is much easier to forget as well. As a manager, you don’t see your team every day. You lose many opportunities for feedback and coaching. It should never be assumed that no news is good news. In order to combat the lack of an interpersonal office environment, you need to create an engaging team environment that cultivates a top-notch feedback culture. Creating a predictable feedback system will go a long way in gauging your team’s engagement and managing expectations. It’s important that your team members hear what you thought about their last project. This is where then mentoring role of your leadership identity comes in. Consistency in these questions will make it easier to prepare and also provide a metric to gauge team engagement over time. Working for a team where positive feedback a mainstay can be a great motivator, and also go a long way in building team spirit. Don’t let the fact that you work remotely keep you from feeling connected with your team. Regularly provide your virtual team members positive and encourage peers to celebrate your wins! If you make it quick, easy, and public to share praise with your team, you’ll create a culture of positive feedback. A great tool to use for this is Slack. Create a dedicated Slack channel for posting feedback and victories for your team. You’ll notice that the more people received praise notifications the more likely they are to share praise with others. The trend is most certainly moving towards the virtual team model. By taking the time to understand how you can successfully master delegation when it comes to working with virtual teams, you will soon be well on your way to finding success with your own team, and benefiting from everything that going virtual has to offer. Considering hiring a new team member? See what you need to know about Managing a Remote Workforce. 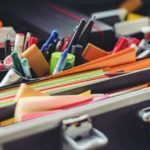 Previous Previous post: When Is It Time to Delegate Tasks?